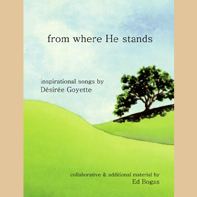 Désirée Goyette’s first inspirational CD release FROM WHERE HE STANDS, remains a best seller and includes the original solo recording of I AM THE LORD, now a favorite hymn in the New Christian Science Hymnal Supplement. This lavishly produced CD features seven originals, two beloved hymns, and a forty-piece orchestra. O captive, rise, thy Saviour comes to thee. And I will give thee peace.